New Delhi: Trade, security, naval exercises, nuclear and solar energy, people to people contact and a visit to the Taj Mahal are expected to be the high points when the French President Emmanuel Macron and his wife Brigitte Marie-Claude Macron visit India from March 9 to 12. Prime Minister Narendra Modi and Mr Macron are scheduled to hold bilateral talks on March 10. "The visit of President Macron is aimed at strengthening the bilateral economic, political and strategic dimension of our engagement," a statement of the Ministry of External Affairs said. Several significant agreements are likely to be inked. NDTV has learnt from sources that agreements on civil nuclear cooperation, solar energy, and transfer of electric mobility for Indian Railways and Metro lines linked to smart city projects - for cities like Pune and Nagpur - are on the cards. The French President will also visit a solar hub near Varanasi. With growing power tussle in the strategic Indian Ocean, naval military cooperation with France, which could go all the way to Djibouti, will be one of the high points. The naval military cooperation will be over and above the joint military exercises that the India and France already conduct. Prime Minister Modi and President Macron will co-chair the Founding Conference of the International Solar Alliance (ISA), on March 11. The ISA is a flagship Indian initiative launched by the Prime Minister and the French President on the sidelines Paris Climate Conference in 2015. This meeting will be of great significance in the backdrop of the United States, under President Trump, pulling out of the Paris accord, and India and France pledging to achieve reduction in emissions committed at Paris. The India-France CEO's Forum will also take place during Mr Macron's visit. The bilateral trade between India and France touched nearly $11 billion during April 2016 to March 2017. France is the ninth largest investor in India, with a total investment of over $6 billion, from April 2000 to October 2017 and nearly 1000 French companies operate in India. Around 120 Indian companies have invested more than 1 billion euros in France and employ nearly 7000 people. 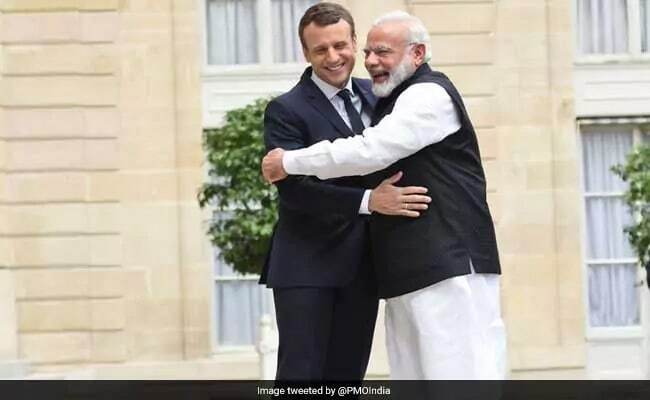 On Sunday, Mr Macron will meet students at the Bikaner House as France aims to get more Indian students in its universities - from the current 5, 000 to at least 10,000 in 2019.